Do you feel the need for a personal outdoor space to call your own and simply ‘be’? 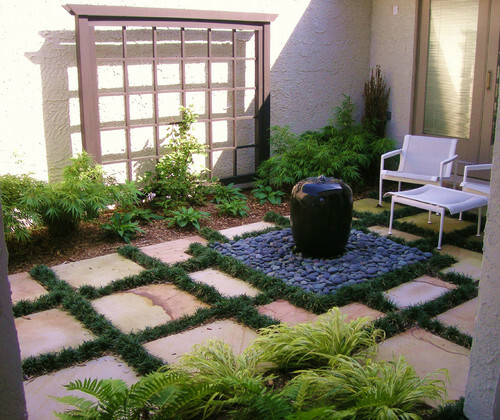 Are you looking for a way to carve out a quiet meditation garden where you can practice yoga or pray? Or perhaps like my client you seek an environment where you can be surrounded by a garden as you celebrate the life of a loved one while allowing yourself time and space to heal? The circumstances may vary yet our desire for inner peace is a unifying theme. This is the story of how I set out to design a garden for a client we shall call Sarah. Sarah’s parents had both recently passed away and she asked that I create a memorial garden that would both celebrate their lives while also giving her a special place to reflect. Life takes us along a series of paths, some unexpected, some carefully orchestrated yet each memorable in its own way. In this garden the main pathway of bluestone pavers meanders at a comfortable pace, allowing time to enjoy carefully placed ‘garden moments’ of fragrance, sculpture or form. At intervals along this section of the journey a series of round posts flank the path, set in such a way as to suggest the rolling topography of hills and valleys. A miniature landscape of sorts that reminds us that life is never straightforward yet has a plan, a form, a design. Like many of life’s paths this diverges and one can choose to take a narrower path to a partially obscured seating area which is only fully revealed on venturing into the unknown. A secondary pathway leads from this seating area, down through an area of mostly native plantings to a private arbor. This path consists of hazelnut shells, crunching underfoot as one takes care to stroll at a more leisurely pace. Boulders are used to retain the mulch as well as provide steps down the slight incline. It seems that most of us feel most at peace when we are within a garden. We may each describe it differently- a sense of being connected to God or Nature, but there is something about being surrounded by beauty, by living things and by feeling the breeze and sunshine on our weary bodies that helps us to slow down, breathe a little easier and get things back into perspective. I created three seating areas in this garden each with a unique character, view point and feel. The largest of the three is directly outside the master bedroom, accessed through sliding glass doors. I replaced a small concrete slab with a much larger grid of bluestone pavers separated by dwarf green mondo grass. This immediately gives a sense of being in the garden rather than sitting back and merely observing it. The view from here offers glimpses of most of the garden although one has to venture out to see things more clearly. A second semi-private space is created on a small knoll with a gravel base and stone bench just large enough for one. This bench looks down onto a bubbling fountain and is sheltered by a large Japanese maple which will rustle in the breeze. The most private space of all is an arbor set within a more naturalistic planting. An integral bench will allow Sarah to enjoy the fragrant vines overhead while a small deck gives this a sense of being a viewing platform, looking towards the house yet with most of the garden journey hidden from view. Old, mossy tree stumps and ferns dominate this area. This is not a place for overly bold and bright plant combinations in a rainbow of colors. Rather it has a restful scheme of shades of green from soft yellow-green to deep, dark shades with accents of burnished copper and burgundy. The backdrop to this garden is one of towering hemlocks, western red cedar and Douglas fir so this creation is essentially an understory. Many Japanese maples have been added; both upright and weeping forms with finely dissected foliage and broader more typical leaves. While summer shades are green and deep burgundy, fall will bring a blazing riot of fiery gold, orange and scarlet. These deciduous trees have been balanced with many broadleaf evergreens including the multi hued Gulf Stream heavenly bamboo, the tall holly-like Charity Oregon grape and variegated rhododendrons transplanted from other area of Sarah’s garden. Gulf Stream heavenly bamboo is a favorite for soft feathery texture and a blend of warm colors. Japanese black pines, a weeping blue atlas cedar and prostrate deodar cedars bring the color and texture of conifers down to a more human scale and like the evergreen shrubs add year round color to the garden. Swathes of Japanese forest grass line the primary path, first on one side then on the other, emphasizing the sense of meandering. Smaller clumps of variegated Japanese sedge will be planted loosely around the water feature. This garden relies on foliage for color but I have included two varieties of winter blooming hellebores; the deep rose-burgundy Merlin and creamy white Monte Cristo, both of which I have grown and found to be hardy, long blooming and easy care. Winter interest is not limited to foliage and flowers, however. Several maples have colored bark most notably a coral bark maple and two clusters of Midwinter Fire dogwood shrubs. A garden such as this would not be complete without the sensory element of fragrance. Each seating area offers something different; winter daphne, akebia, witch hazel and Oregon grape. Using natural elements was important as was a simplistic style. A low basalt dish will rest on a stone slab. Water will pour from a bamboo spout onto the dish, sheeting over the slab and disappearing into a hidden reservoir . This will be seen and heard from the master bedroom as well as various points in the garden. Cairns have been used for centuries to mark a trail or signify a memorial site so it seemed appropriate to include an artistic representation of such a feature in this garden. A custom made cluster of three stacked rock sculptures, designed by local artist Luke deLatour marks the trail leading from the main pathway to the hidden stone bench. The tallest of these will have an eye carved in the final stone. Portals such as this focus the eye and help us see things differently, an important element of meditation, reflection and healing. My clients mother was an artist and so I wanted Sarah to have the opportunity to design and perhaps create something unique that would represent the Circle of Life. This art piece will hang on a wall and only be visible from the most secluded arbor. The design is complete and my client is thrilled that I captured her vision and translated it in a respectful and thoughtful way. I hope I have incorporated elements that will make her smile as she celebrates her parents lives and heal as she reflects on special memories. I have really enjoyed this look behind the curtain of the design process and can’t wait to see the final planted landscape, especially the cairns. Very nicely done, Karen. Patrick I am equally excited to get started and see it all come to life. Thank you Karen– just lovely. I appreciated not only the lovely photos but also your sharing your creative process (es). I know there will be a spot for some of Luke’s cairns in my garden soon– I know I can find room for them! Looking forward to more photos of “Sarah’s” garden as it develops and matures. I’m sure you’ll find room Suzanne! I find pathways very special and spiritual in the garden. Thanks Karen. Thanks for your comment Susan – I so agree.